Adam Waller held his nerve to defeat last years winner, Alan McCarthy, in a thrilling 4 frames to 3 battle. Adam, in taking out the title also beat Newcastle’s Eric Bauer and 2015 & 2016 winner, Rob Elsley. Alan McCarthy made the tournament high break with a 100. Full draw can be found here. 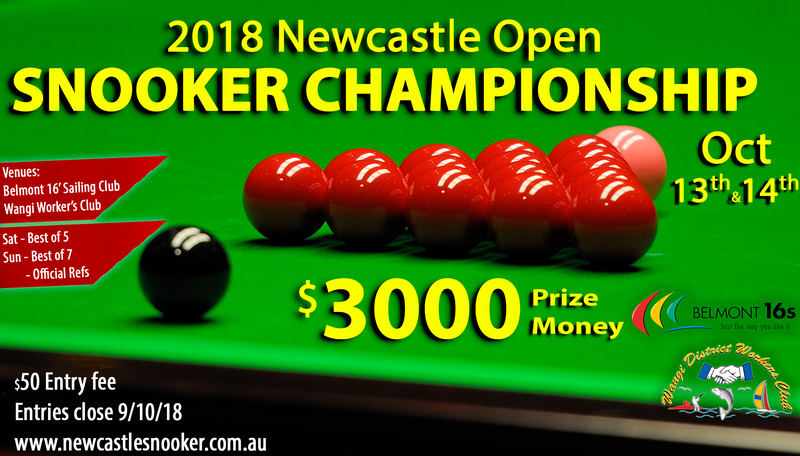 2017 NSW Minors Champion Alan McCarthy has added the Newcastle Open to his list of accomplishments defeating Rob Elsley in a close fought final. The final score was 4 frames to 3 in a late finishing, attacking final which saw Alan beat Rob, the defending champion. A big thanks you to Wangi Workers and Belmont 16′ for co-hosting the tournament and the NDBSA Committee members who helped run the successful event. The NDBSA is delighted to announce that entries for the 2017 Newcastle Snooker Open have been accepted and the draw has been done. A total of 39 participants will make for an exciting weekend but also a long one with both 3-table venues, Wangi Workers Club and Belmont 16′ Sailing Club hosting a full Saturday of matches. Could participants please be in attendance on time for early matches and 1hr + early for the later matches as often matches can go quicker then planned. PLEASE NOTE: Previously advertised venue Cessnock Ex-Services Club is no longer available so double check your allocated venue next to your name in the draw. A website viewable draw can be seen here – Wangi Workers hosting top half on Saturday and Belmont 16′ Sailing Club the lower half. Spectators most welcome at both events. Wangi Workers Club will host all Sundays matches.